If you’d said a month ago that you had no reason to be excited about a Toyota Corolla, I’d understand. Not anymore. 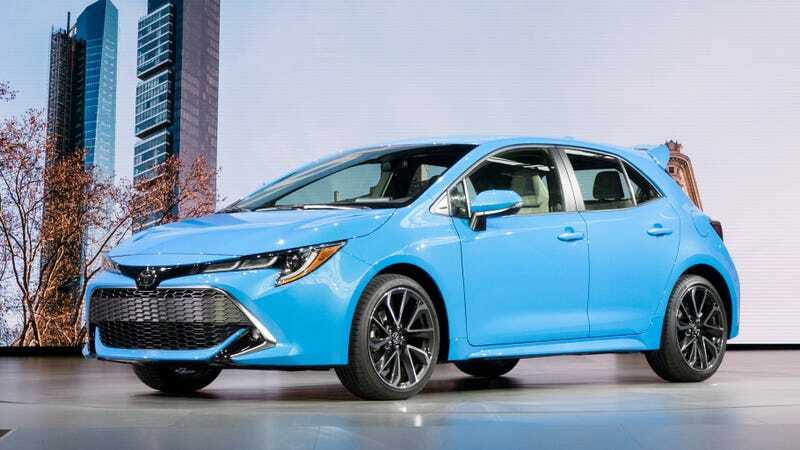 Not since we learned that the 2019 Corolla hatchback with a six-speed manual was coming. Here’s why it’s important. In an age where swarms of so-called “driver’s cars” are moving towards automatic and dual-clutch transmissions, it can seem weird that Toyota has chosen to stick a manual in what amounts to its affordable economy car. You know, the car that the masses are supposed to buy, not the enthusiasts. While we laughed about how the new Camry’s looks suggested sportiness without actually providing any, the rather understated Corolla actually does. But that’s exactly what carmakers should be doing. So many of what we now think of as historic “driver’s cars,” like the original Mini, or the original Civic, were just intended to be economy cars for the masses, and became known as enthusiasts cars purely by virtue of being small, lightweight, infinitely chuckable and equipped with a manual transmission. The new Corolla hatch rides on Toyota’s TNGA platform (which you can find in the current Prius, C-HR and Lexus UX). Toyota told me that it has an increased body rigidity and lower center of gravity. That, paired with the new high compression 2.0-liter engine—it seemed like the manual was the last piece that was needed and it’s just what we got. And it’s not just a six-speed recycled from some other car. It’s a brand-new transmission for the Corolla, Toyota’s chief engineer Yoshiki Konishi, told me. It’s called the Intelligent Manual Transmission. Konishi said that they wanted more people to have that fun-to-drive feeling. That widespread appeal also extends to the tactile feedback of the manual. The IMT will have a certain amount of built-in smoothness, because Konishi also added that the engine and shift speeds have been synchronized for a “no shock, very smooth” shift action. While that may disappoint some people who really relish in the art of perfecting a gearshift, this is actually a good thing for those people looking for a nice little manual as their first car to learn on. Clearly, I haven’t driven it yet, but it sound like a friendly gearbox. Would it be used in future Toyota models? Konishi confirmed that it would, but then declined to clarify which. And what about a possible all-wheel drive Corolla? It’d be a long shot, but I had to ask anyway. Konishi shrugged and gave the typical “We’re looking into it” response. I asked Toyota how many of its new Corolla hatches will be manuals. They didn’t have a specific answer for me—they said they are still studying the numbers—but they are also keeping a close eye on competitors like Honda, which offers about 20 percent of its Civic hatchbacks with manuals. I hope so, too! There are only a handful of cars on the market today that offer a manual transmission, and none of them position themselves quite as welcomingly as the Corolla hatch does. Perhaps this hatch will embolden new drivers who are timid to the idea of a manual and convert them for life. Then those drivers will make a bunch of noise about how manuals are great and then yell for more manuals and then more automakers will offer them and then all will be right in the world once again.